Meadows covered in native grasses interspersed with wildflowers are possible in heavy clay and full sun. Large problem areas appear lush with tolerant, adapted groundcover plants. Small garden spaces among stepping stones or in the rock garden require careful groundcover selections where full, bright sun and clay soil present challenges. Improve clay where possible by working organic matter into the soil. Regular applications of composted mulch eventually improve drainage in heavy clay. 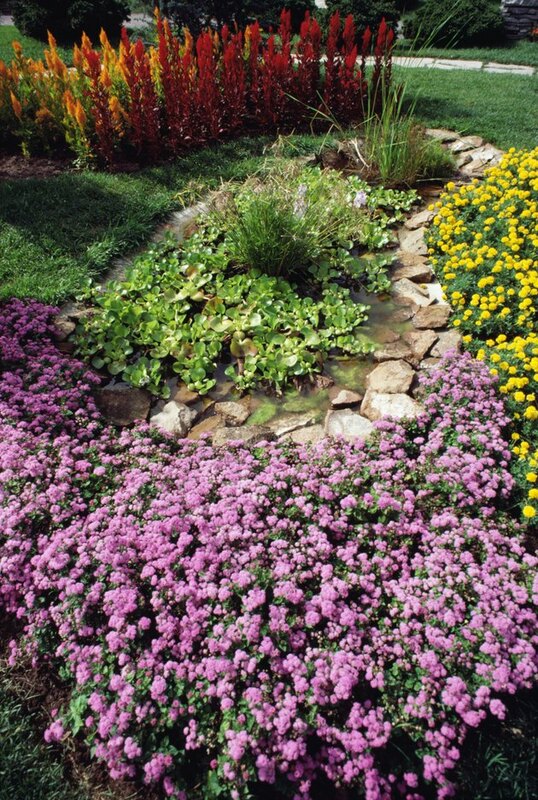 Widely adapted groundcovers are available for tough situations. Native grasses are excellent ground coverings for sunny clay sites. Deeply rooted sand dropseed (Sporobolus cryptandrus) produces graceful clumps of fine-textured foliage for natural meadow settings or as ground covering garden accents. S. heterolepis grows to 15 inches tall and slightly wider, with pinkish, popcorn-scented summer flower plumes. Grama grasses (Bouteloua) create attractive meadows. Blue grama grass mowed to 1.5 inches is an acceptable turfgrass. Buffalo grasses (Buchloe) prefer heavy clay soil in areas of low rainfall and are available in several climate-specific hybrid varieties. Vincas tolerate clay and sun exposure. Vinca major is aggressive; rooted cuttings spaced at 6 inches cover an area within a year. It is less likely to become invasive in full sun. Flowers appear in spring and are attractive blooming along with interplanted daffodils. Vinca "Variegata" has white-edged leaves. Dwarf periwinkle (V. minor) is smaller and less aggressive. Several varieties provide flower color choices from white to deep blue, or variegated foliage. Vincas produce darker foliage in shaded areas but flower more profusely in full sun. Yarrows (Achellea) are tough, versatile perennials with attractive, ferny foliage and colorful, long-lasting summer flowers. Yarrows thrive in full sun and problem soils. Greek yarrow (A. serbica) forms low mats of silvery, lacy leaves and white flowers on 4- to 10-inch-tall stems. Wooly yarrow (A. tomentosa) spreads low with hairy, grayish-green leaves and bright yellow flowers. Common yarrow (A. millefolium) is available in several hybrid varieties and flower colors. Shear taller types to keep growth low. Yarrows are drought tolerant and widely adapted. Consider low-growing, clay-and-sun-tolerant woody perennial shrubs for large areas difficult to access. Vigorous growing gray dogwood (Cornus foemina) is a widely adapted North American native. Large white flower clusters appear in spring giving way to purplish new growth. Brilliant red fall foliage and bluish-white fruits extend seasonal color. Sweetspires (Itea virginica) are widely adapted North American natives. Little Henry is a compact variety with white, fragrant summer flowers, glossy green summer foliage and brilliant fall color often persisting into winter. Purplish winter stems complete year-long interest.